These Halloween treats are just made from just fruit, vegetables and a few drops of dark chocolate. They are a healthy alternative to all the processed Halloween sweets that are full of refined sugar, artificial flavours and other nasties. All are vegan / plant based and gluten free. Simple and fun for any age to make. If you make a version of these please do tag us on instagram @nestandglow or facebook nestandglow. Drain a tin of lychees and shake to remove any excess fluid. Try to get lychees that are in fruit juice rather than in syrup. You can use fresh lychees but be warned its very time consuming and difficult to remove the skin and stone while keeping the fruit whole. Stuff the hole with dried vine fruit such as raisins. For blood red eyes stuff with dried cranberries. The best dried cranberries to use are the ones that are sweetened with pineapple juice rather than sugar. You can use shop bought chocolate chips for these, but I struggle to buy good quality chocolate chips so I make my own. Also this gives the ghosts a great non-uniform appearance and you can bring out your creative flair. I use a very high 85% cocoa content as it has only a tiny amount of added sugar and with all the sweet fruit a tiny bitter bite tastes great. Chop up and melt the chocolate in a bowl that’s in another bowl of warm water (bain-marie), you only need about 15g to make enough to decorate 10 ghosts. I tend to melt 2/3rds of the chocolate until its liquid, then remove from the heat and add the other 1/3 and stir until melted. This is an easy way to temper chocolate and makes it the right temp for the crystals to form glossy chocolate without messing with a thermometer or waiting around. Drop the chocolate however you like onto a non stick sheet and place in the freezer for 5 mins. Peal and chop all the bananas in half – ensuring that they can stand. 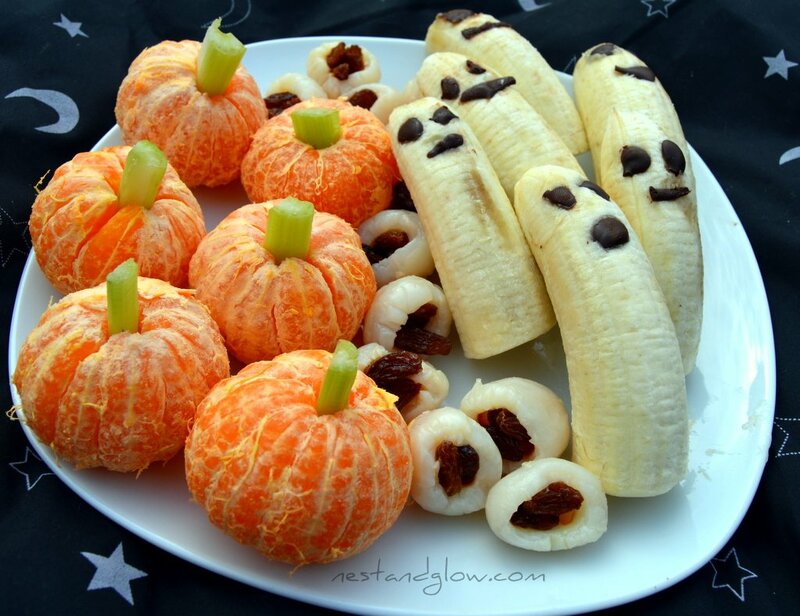 Take out the chocolate drops and then push into the bananas to decorate. Peal your Clementine and then slice an inch of celery into a thin strip to push into the centre of the fruit. If you cant get clementines then any other small easy pealing fruit such as satsumas, mandarin or tangerines works just as well. Also the celery can be replaced with any other green vegetable such as cucumber or courgette (although these are technically a fruit). Great. We are happy to receive more inspiring ideas and receips from you.